Last weekend we made our first visit to St. Paul’s College in Washington, DC. Taking advantage of a Utah state holiday, we left early Thursday morning and returned on Sunday. 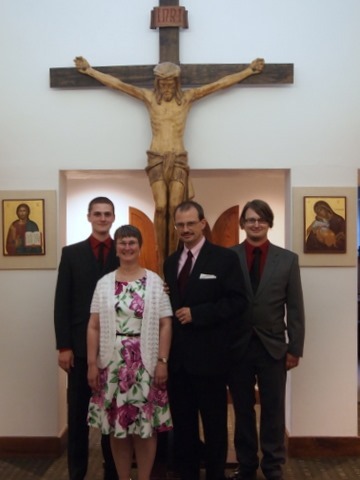 The occasion was the 2014 First Promises Mass. As I understand it (and if I get this wrong, please let me know and I’ll correct myself) the novice year is explicitly a time of discernment — both for the candidate and for the community. As the end of the year approached, all four of this year’s novices were evaluated and a decision was made about their suitability for the community and their readiness to continue their formation. It is also the point at which the novices become full members of the society and earn the privilege of putting CSP (Congregation of St. Paul) after their names. Fr. Eric Andrews, the newly elected president of the Paulists, traveled to DC to celebrate the Mass and to receive the promises from the students. Director of Novices, Fr. Rich Colgan, con-celebrated the Mass. It is difficult to capture the Mass using the written word. There are moments that stand out strongly in my memory. When it came time for the Liturgy of the Eucharist, the four mothers were asked to bring up the gifts. This was especially powerful. It spoke to the fact that these women had made gifts of their sons to God — much like Hannah giving Samuel to God. For me, this was a profound sign of their faith in God. After the Mass, there was a reception in the common room with finger foods and good company. Of course the families of the novices were present including parents, siblings and more distant relations; our own contingent consisted Cathy, Ian and I as well as Cathy’s parents and sister from Erie. 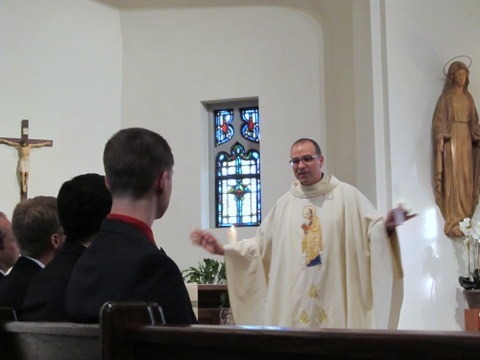 The priests from St. Paul’s college were in attendance as were the externs — priests who are living at St. Paul’s while they work on their studies at the nearby CUA. 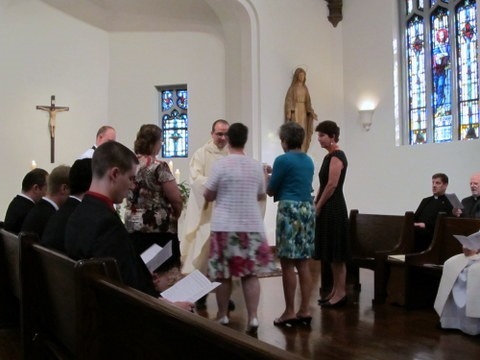 Although the students are all away on summer assignments, many of them returned for the Mass. That gave us the opportunity to meet Stuart Wilson-Smith, Michael Hennessy and Matt Berrios (who was the cantor for the Mass — he has an awesome voice and an epic beard). We also got to meet several of the Paulist Fathers including Fr. Frank DeSiano, Fr. Charlie Donahue (who was very kind and supportive when he talked to Cathy and shared his vocation story), and Fr. Steven Bell (Busted Halo and shortly to be re-assigned to Ohio). We met so many people it was hard to keep track of them all and I apologize if I missed anyone. Not remembering all of them is a shame because what we found was an incredible community filled with light and the joy of a shared mission. As guests of the house, we were able to participate in the life of the community by attending the Friday morning prayers and Mass and by taking our meals with the community. (Aside: The cooking staff at St. Paul’s college does an incredible job of providing great meals for all who live there.) Everyone we met was genuinely welcoming and we had some fascinating conversations over our meals. Likewise, it was great to meet the other novices and their parents; to hear about their spiritual journeys and how their experiences were similar to our own. It made me wish we lived in a more Catholic part of the country so that we might be able to form some sort of parents’ group for vocations. We also managed to fit in a few tourist-y things; the Smithsonian Museum of Natural History, the monuments of the National Mall, the Franciscan Monastery of the Holy Land in America, and the Basilica of the National Shrine of the Immaculate Conception. All of these were wonderful moments during the trip, but what I most remember is the joy of having our family together to celebrate this important moment in Evan’s formation journey. Thank you for the kind words, Fr. James. We had a great (and spirit-filled) time in DC. The community was incredibly welcoming and we enjoyed meeting everyone there. You are in our prayers as well. This entry was posted on August 3, 2014 by kevinleec in Life Events, Seminary and tagged family, Mass, noice, paulist, promise, student.